Champion Sports is proud to offer you our exclusive portable tetherball set with free air pump and carrying case. This high quality travel set is perfect for tetherball games at the beach, in the back lawn, or at birthday and pool parties. Our portable tetherball set includes a weatherproof nylon rope, soft inflatable rubber tetherballs and a telescopic pole stake that can be adjusted to fit varying heights. Telescopic pole mounts easily and securely into the outdoor ground and can be adjusted to fit kids, teens, or adults for customized gameplay anywhere. Tetherball is a favorite campground classic that you can now enjoy anywhere. Turn a simple backyard barbeque into a fast paced competitive and recreation game the whole family can enjoy. Secure pole in your lawn or at the lake or beach for hours of fun for an age. GREAT OUTDOOR GAMES FOR KIDS & ADULTS Tetherball is an easy game to play for boys and girls and can be easily set up in minutes. The portable set is perfect for after school programs, rec centers, gyms, churches, and youth groups. A fun and easy way to get folks of all ages up and exercising. 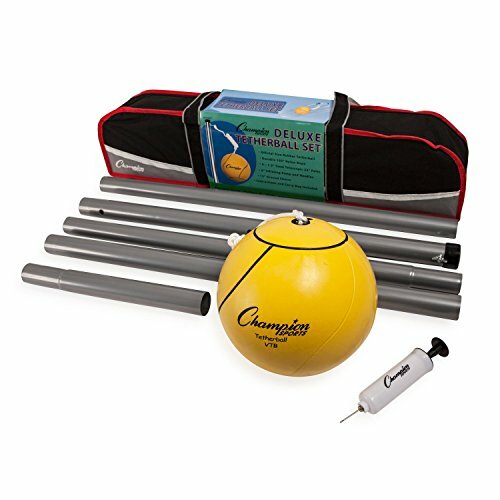 Champion Sports portable tetherball kit includes a complimentary canvas carrying case with secure zipper closures to secure your set when you travel and keep items together for convenient storage. Set also includes a free 6 inch air pump and needle to easily inflate your rubber tetherball, or any other inflatable basketballs, footballs, or playground balls anytime. - 7 Piece Portable Tetherball Set Includes Rubber Ball, Nylon Cord, 4, 24 Inch Telescopic Poles, and 1, 12 Inch Ground Stake Sleeve. - Set Also Includes Complementary Carrying Case With Strap and 1, 6 Inch Air Pump With Needle.